In the refrigerator - CREAM! We had a big surprise today at the Dungeness Valley Creamery. They had, of all things, cream. The Browns had been talking about selling cream to the general public, but this is most likely a one time thing. 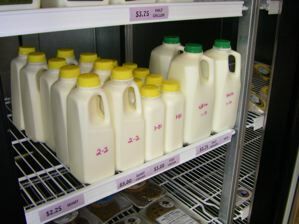 Mount Townsend Creamery is redoing their cheesemaking setup, so they aren't buying any cream. That means, cream at the creamery, but it's an awful tradeoff. It may be a while before they start producing their wonderful cheeses again.